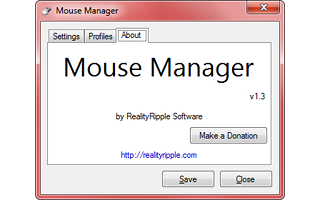 Mouse Manager is free software supported by donations, not advertisements. Welcome to the Mouse Manager home page! Since the middle of 2010, Mouse Manager has been making mice more useful. How? By letting you control what the extra buttons on your mouse do. Most mice today have five Buttons: Left, Right, Wheel, and two more which usually are functionally the same as hitting the Back or Forward Buttons. Some games call these buttons Mouse 4 and Mouse 5. Mouse Manager takes advantage of the general disuse of these two extra buttons by letting you reconfigure what happens when you press them. Namely, it allows you to set these buttons to any keyboard key or series of keys you choose. So, if you set the Fifth Button to the letters H, E, L, L, and O, every time you press the Fifth Button on your mouse, your computer will think you typed "hello" on the keyboard. The interface of Mouse Manager is extremely simple. Most of the time, you probably won't even pay attention to it after you've configured it, but the Tray icon will always be there in case you want to toggle a profile or turn off the program for a moment. The actual interface is opened with a single left-click on the Tray icon, which contains three simple tabs: Settings, Profiles, and About. 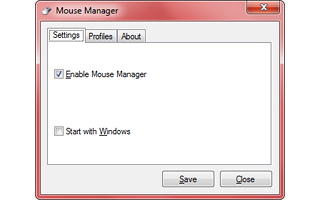 The Settings tab is fairly simple: The top checkbox, labeled "Enable Mouse Manager" simply turns the functionality of the program on or off without having to stop and restart the program. If you ever need to go back to the normal use of your mouse, you can just uncheck this box and hit the "Save" button. Below that is the all-important "Start with Windows" checkbox: chances are you'll want this checked so you don't have to open Mouse Manager yourself every time your computer starts. 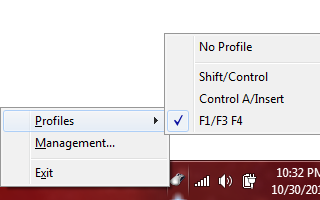 The Profiles tab is where the "meat" of Mouse Manager resides, containing another deceptively simple interface. To create a new profile, simply hit the "Add" button. A new profile will appear in the Profile List at the top, and you'll be able to begin setting up the profile immediately. First, click in the textbox marked as "Mouse Button 4" and hit the keyboard key or series of keys you want to occur when you press the Fourth mouse Button. If you want to disable the Fourth mouse Button entirely, just hit the "X" button next to the textbox; the mouse button will do nothing when pressed. Make your selections the same way for "Mouse Button 5" to assign commands to the Fifth mouse Button. When you've set the profile up the way you want, simply hit the "Save" button and close the Mouse Manager window. You may have noticed that each profile in the Profile List has a checkbox next to it. This checkbox lets you choose between the profiles you create. The same list is available through the Tray icon via the right-click menu: simply open the "Profiles" menu item and all of the profiles you've made will be listed. Click on one of these menu items to choose profile you want to use, or click "No Profile" to turn all profiles off. 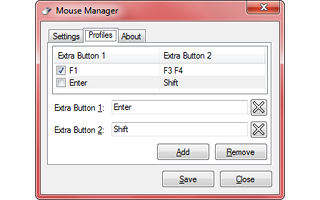 Mouse Manager is free for use or modification without limitation. However, it comes with no license, warranty, or guarantee of any kind. That being said, you can still ask any questions in the Comments section below, or contact me directly for assistance. If you're looking for a translated version, check out Advanced Mouse Manager. Deutsch, Suomi, Français, and Español are already supported, or you can get a free copy just for adding a translation in your native language! I'm afraid I don't quite understand what kind of setup you're trying to create. Mouse Manager does not handle complicated macro abilities, and can't emulate button clicks. It can press multiple keyboard keys with a single click, but it will be the same sequence every time. You can create different profiles of these individual keys or sequences and choose between them through the system tray icon, but you can't choose between them by clicking. You'll need more complicated macro software to do something like that. I used this for about a year but ever since yesterday, it stoped working. I have no idea what happened, but I know its nothing about the mouse? were there any updates yesterday?